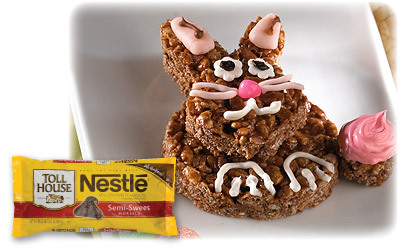 If you are looking for a sweet treat to serve as dessert for your Easter dinner why not try these cute little chocolate bunny treats. A chocolaty spin on rice crispy treats. From start to finish depending on how many you make can take less then an hour. It would be a perfect treat to make with your kid These are pretty simple to make and each batch makes about 4 bunnies depending on the size of your cookie cutters. Ok now you have your supplies and your ingredients lets begin. of marshmallow creme instead of the marshmallows. 2. Once your mixture is completely melted and blended add your Kellogg's Rice Krispies® cereal. Stir carefully until well coated. 3. Using wax paper, press mixture evenly into a 15 x 10 x 1-inch pan coated with cooking spray. Cool slightly, this is going to work much better if your mixture is still somewhat warm. 4. Coat your cookie cutter with cooking spray to keep your rice krispies from sticking to them. Cut your mixture with your cookie cutters. Attach one rabbit head shape to top of large circle shape with frosting. Attach one small circle for tail to each. Decorate with frosting and/or candies. Best if served the same day.